Our adopted boys have been with us over three years, yet I’d never properly come across the idea of ‘therapeutic parenting’ until two years in. As we’ve become more familiar with this approach, we’ve started to ask what does the Bible say about therapeutic parenting? Adoption training tends to focus on the approval and matching process, and more general aspects of child development, with a nod towards how you may actually want to parent your child once they arrive (I know this because I literally just decluttered our adoption training notes yesterday so had a good flick through!). To be honest, the job of knowing how to parent adopted kids is not really the job of social workers. Their focus is the journey towards adoption, not what happens afterwards. And even if they had told us, the seeds would likely have fallen on unploughed fields. Much of the advice wouldn’t have made sense until we had adopted children of our own. So anyway, we pootled along with our family life, vaguely noticing that our adopted kids responded differently to things than our birth kids did at the same age, but really too exhausted to think too much about it, until – two years in – I articulated myself clearly enough to write Five Ways My Toddlers Are Different From Yours. It made a few waves. Lots of people started messaging me saying, “Yes! Us too!” or “Thank you for putting our experience into words”. I’d encouraged them, but their reassurance that we weren’t alone was deeply encouraging to me. One of the respondents recommended the National Association of Therapeutic Parents to me, and I joined their Facebook group. I later read and reviewed founder Sarah Naish’s incredibly helpful book The A-Z of Therapeutic Parenting. For the benefit of anyone who isn’t familiar with this approach, therapeutic parenting is a way of ‘re-parenting’ children who have experienced trauma in early life. Vulnerable children may not have known the love and nurture necessary to develop healthy brain pathways. They may not have had the boundaries necessary to thrive in a safe environment. And they may not have had the routines necessary to give them the ability to predict future events (whether this is the next meal, or a move to a new school), which most of us take for granted. Therapeutic parenting therefore emphasises clear and consistent boundaries, a strong parental presence, and an empathic response to children’s behaviour, choosing to remain calm and deal with the emotions behind the behaviour, rather than (or sometimes in addition to) the behaviour itself. I’ll be honest, I’m pretty rubbish at it, particularly the staying calm bit. But I’m learning. As Christians, it is critical that we interpret the culture around us – including parenting styles – through a Biblical lens. 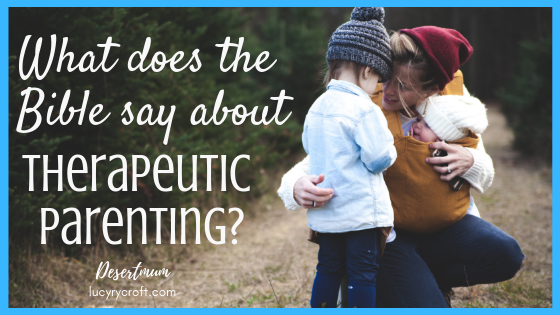 So, what does the Bible say about therapeutic parenting? 1. God is the perfect therapeutic parent. Therapeutic parents understand that their children’s behaviour is affected by their traumatic early life experiences. They attempt to look past the immediate behaviour, and see instead the underlying issue that needs to be addressed. Jesus was a master at this. In Matthew 9, we read that he looked straight at a paralysed man and said ‘Your sins are forgiven’. Jesus knew that the man’s heart was more important than the fact he could not walk. Even on the cross, as he was dying, Jesus was able to see past the behaviour of those who had cruelly nailed him to the cross, saying, “Father, forgive them, for they do not know what they are doing” (Luke 23:34). “He will not shout or cry out, or raise his voice in the streets. God knows that our children are ‘bruised’, and He knows when they (or we) are ‘smoldering wicks’, dangerously close to the end of our resources. He knows that, in this situation, to ‘shout or cry out, or raise his voice’ will be counter-productive. It will be enough to finish us off. Of course there were times when Jesus did have to raise His voice – but it wasn’t in His interactions with those who were needy, vulnerable, bruised and about to be snuffed out. Therapeutic parenting, likewise, advocates staying calm and not using raised voices. These can often provoke negative memories in our children, and the associated emotions of fear and isolation. As Christian therapeutic parents, let’s use the strategies, but also remember that God can give us divine revelation into our children’s minds, which will help us to see past the presenting behaviour. Don’t be afraid to pray, “Lord, let me know what’s going on inside them, so I can make wise decisions”. 2. The Bible tells us parents that we make wrong choices too. The therapeutic parenting model agrees, acknowledging that the way we respond to our children can often be as a result of our own emotional needs, character flaws or past experiences. But it encourages us to become aware of our responses to our children, finding a way forward that is full of patience and gentleness. So, again, therapeutic parenting ticks a box as far as the Bible is concerned. 3. The Bible offers us a different understanding of the condition of the heart. Part of the narrative of therapeutic parenting is reassuring children, following an incident, that they have a ‘good heart’, e.g. “I know you have a good heart, and I think you know what to do to put things right”. This is where God sees things differently. Jeremiah 17:9 says “The heart is deceitful above all things and beyond cure” while Genesis 8 recounts God saying “…every inclination of the human heart is evil from childhood…”. This doesn’t sound very encouraging! Where is the hope? Our hope is that there is something better than having a good heart: having a pure heart. Jesus can restore our hearts and make us pure in God’s sight. Actually, this is infinitely more affirming than telling our children they have ‘good hearts’, because ‘good’ only lasts until the next ‘bad’ thing. Rather than beating themselves up about their failure to conform to expectations, our children have the immeasurable, eternal hope that, through Jesus, God can make their hearts pure forever. So what language can we use with our children? Instead of “I know you have a good heart”, we could say (depending on circumstance), “God loves you so much – nothing you do can change that”, “God can change our hearts”, “God can give you a pure heart”, “Sometimes I make bad decisions too but God still loves me”, “Shall we pray about this?” and so on. 4. Both therapeutic parenting and the gospel advocate for changed lives. Hooray! We are heading towards the same goal. The way we get there, however, is different. 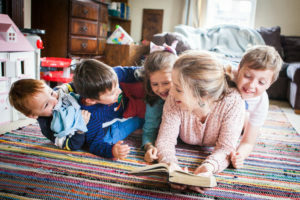 Therapeutic parenting puts its trust in strategies and techniques, honed through years of experience. While there are some excellent strategies outlined in this approach – and I’m grateful for those which are helping our own children – only the Holy Spirit has the power to ultimately change our children’s lives for the better. We can help our children to deal with their past, and hopefully we and they will see some progress as the years go by, resulting in fully-functioning adult members of society. This is so encouraging! But God goes one step further – through Jesus’ blood, we are counted as 100% righteous, 100% perfect – even though we still make bad decisions. This is life-changing! Our goal must be, first and foremost, to lead our traumatised, vulnerable children to the God who changes them and makes them whole. He gives us many beautiful gifts to help enable this change, and I firmly believe therapeutic parenting is one of them. But, like any of God’s gifts, they are not to take the place of the Giver himself. He alone is the source of healing, redemption and wholeness. Over to you! Do you use this approach with your children? What helps? What hinders? Therapeutic parenting benefits all children, not just those from a care background. If you haven’t come across it before, do you think it could help your children? I’d love to hear your thoughts in the comments!